Stewart O'Nan's thirteenth novel is another wildly original, bittersweet gem like his celebrated "Last Night at the Lobster." Valentine's weekend, Art and Marion Fowler flee their Cleveland suburb for Niagara Falls, desperate to recoup their losses. Jobless, with their home approaching foreclosure and their marriage on the brink of collapse, Art and Marion liquidate their savings account and book a bridal suite at the Falls' ritziest casino for a second honeymoon. While they sightsee like tourists during the day, at night they risk it all at the roulette wheel to fix their finances-and save their marriage. A tender yet honest exploration of faith, forgiveness and last chances, "The Odds" is a reminder that love, like life, is always a gamble. Stewart O'Nan is the author of twelve previous novels, including "Songs for the Missing, A Prayer for the Dying," and "Snow Angels." In "Faithful," he and Stephen King chronicled the 2004 Boston Red Sox. He was born, raised, and lives in Pittsburgh with his family. "Stewart O'Nan once drove me too fast through Manhattan at 3 a.m. This book feels just like that. Dangerous, domestic, sad, thrilling, slyly hilarious, and painful. It's a love song, yes, but a love song to a dying marriage. Read it, please." 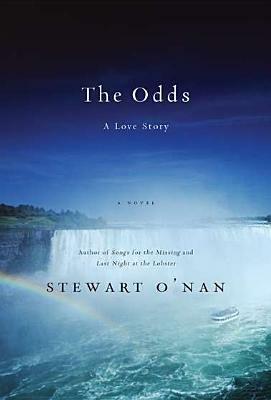 "THE ODDS is a remarkable portrait of a marriage stressed to the breaking point, a husband and wife united and divided by bad luck and their own thorny history. This slender, moving book confirms O'Nan's status as one of the best writers of his generation, a novelist who can illuminate the drama and complexity of everyday life with compassion, wry humor, and unflinching honesty." What is your opinion of Art and Marion’s marriage? Is it worth saving? Is one of them more sympathetic than the other? Early in the novel, Marion believes that she isn’t in love with Art to the degree that she should be; later, Art wonders to himself whether it’s possible to have a sexually passionate relationship at their age. How does love change over the course of a long marriage? Are these changes positive or negative? Who is Karen and what was the nature of her relationship with Marion? Art is ashamed of losing his job and asks Marion to keep his unemployment secret, despite everyone knowing that she too had been fired earlier. Does society place a sterner judgment on a man losing his job than a woman? In the middle of the night, Marion makes a bargain with fate: “If he comes to me now, she thought. If I don’t turn around but just think of him, and he comes to me” (p. 46). Her thoughts suggest that she would be willing to try again with Art but also that she might be looking for a sign that it’s okay to give up. Which do you think is true? Both Art and Marion still nurse the painful memory of his affair with Wendy Daigle twenty years ago. Do you feel that Marion should be over her anger by now, or is it impossible to completely heal a marriage after infidelity? How does Marion’s experience with Karen affect your opinion? Art believes that “drink revealed one’s true feelings” (p. 124) and so when he gives Marion the new ring during their drunken night, he feels that her tearful acceptance signals a renewed love for him. When she wakes up the next morning, she has no memory of the exchange and her response to the ring is markedly different. Which do you feel was the more authentic response? Reread the conversation Marion and Art have on page 160 as they raise their glasses in toast to Valentine’s Day, claiming to love each other “whatever happens.” What are their respective intentions and feelings? Is there any misunderstanding between them? As long as they’re both happy, does it matter? Art and Marion bet their lives’ savings in the casino. Have you ever taken a similarly dramatic risk with some aspect of your own life? What was the situation, what were the stakes, and how did your gamble turn out? Look at the last sentence in the novel. What does O’Nan mean? Do you agree? Do you feel there was a specific moment during their stay that made the ending inevitable?